Joerg Lehmann is stepping onto the centre stage at Newcastle Art Space with a large new body of work. His attachment, dedication and passion for all things Film Noir is clearly on display in Gallery 1. The walls are laden with signs of his connection to the power of light. Images as individual story lines are precisely lit with artificial studio lighting and sometimes enhanced by available outdoor lighting. Joerg always refers to these works as being collaborative works between photography, hair and makeup artists, models and designers who set the stage and develop each sequence. Film Noir does carry with it the nostalgia of times now spent, of a memory attached to viewing the first black and white photography, and acknowledgement of the stylised constructions that both form and inform these works. They are just such a joy to look at and imagine the story, the situation, the drama and the characters. Stepping into the experience may provide a temporary step away from the everyday-ness of our lives and allow an opportunity to fantasise, to imagine oneself in the images, in costume with another persona. Write your own story of connection to the works or engage with Joerg’s. For me personally, the most rewarding images are those without people or with just a suggestion of the human, where I have the freedom to write my own narrative over the surface and I do love atmospheric spaces. Just fabulous. Kalinda Nelson-Boyd is exhibiting work from her recent Bachelor of Fine Art Honours collection. On her artist statement Kalinda refers to her work as being …… “A celebration of non-conformity in the individual construction of femininity, sexuality and gender... Kalinda challenges historical and religious underpinnings of a western cultural context”. Kalinda photographs people mostly in tight interior spaces and then draws out a new image across the surface. The background image appears classical and uses a rich colour palette in which to play out her conversation. She scribbles and breaks down the barriers of the body surface below. In this way Kalinda defaces and re-writes the idea of ‘the norm’, whatever the ‘norm’ is, and layers her figures with altered states of our humanity, with a fluidity of gender and sexuality. 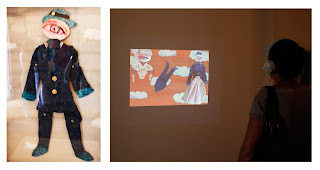 Technically these are digital photographs with a separate drawing made on thin paper and sandwiched together with the photograph in a computer environment. Within this construct Kalinda depicts her female subjects as being all woman in the natural raw state of existence, all knowing, in proud display of all body parts, some unshaven, without fear (or perhaps in spite of fear) of censorship or adherence to any traditional cultural ‘norm’. I Am Untitled 4, (not on show) was a finalist in the Shirl Youth Portrait Prize at Bega Valley Regional Gallery. This particular work started me looking to find ways to connect with the work. I saw her work last year at the Honours show, and at first I was uncertain how to approach the work. The harder I looked at this small image of a female-like figure in full frontal pose, challenging us to accept her, to acknowledge her, the more I discovered. Perhaps it is my age, and acknowledgment that everything in art now reminds me of something else as an automatic normal reaction, but it is difficult to disconnect my initial thoughts about the pose in I Am Untitled No. 4 from the naked female courtesan depicted in Edouard Manet’s Olympia from 1863. Olympia also turns her eyes to the viewer and does not hide from her body and sexual identity. Both poses challenge the viewer to accept the notion of female as a powerful, independent human figure rather than a passive one attached to a set of specific gender-based traits and physical attributes. Then I went back and had a second look at Kalinda’s work, wondering if I was way off track with these connections. Olympia is lost from my memory as Kalinda pushes the idea of non-conformity further onto her surfaces and dissolves the labels of gender and sexuality. I love the Freddy Mercury look-a -like image, because of the colour palette and how it is positioned within the frame. Although a masculine figure on the surface, he is resplendent with the drawn edition of female lingerie over the top. The colour palette and composition remind me (here I go again) of a beautifully tonal Rembrandt and I think of the woman with her fleshy legs exposed as she attends to her bathing in Bathsheba at Her Bath finished in 1654 and the colour palette from A Woman bathing in a Stream from 1654. Am I looking to find comfort by identifying traditional and historical representations of the body within the image? I stepped closer into the frame, looked closer and deeper and of course, spoke to the artist which is sometimes the most important element I think. The actual discussion about the work is important, to clarify, accept, challenge and ultimately understand the concept and methodologies involved. Seeing what is presented on the surface is seldom enough. Knowing what lies behind and underneath the surface is often more significant. Phoebe’s blue and pink costumed figures link to the assignment of a particular colour to a specific traditional and historical gender, i.e. the notion of pink for girl babies and blue for boy babies. The doll figures have no identifying traits about their sexuality with only one large eye representing their faces. There is a video about the work for viewing. All the works in the gallery invite conversation and debate about our bodies, our perceptions and how others view us. Are we not all ‘just human’ under the skin. A fascinating mix of imagery, techniques, media and concepts.